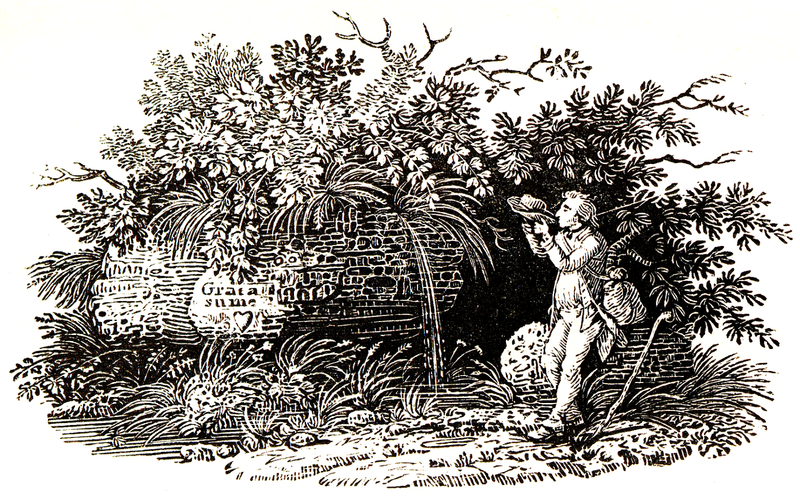 Thomas Bewick (1753-1828) was an English engraver who used metal-engraving tools on boxwood that was cut across the grain - a major innovation in how illustrations were printed. Bewick is best known for his illustrated volumes on the History of British Birds. Along with the main subjects of the book, the birds, Bewick also included numerous tiny and beautifully engraved vignettes which helped pad out the visual space of the pages. "The crucial point about Bewick's vignettes is that they don't have a defined edge. They're not bounded by a formal rectangle or oval... The image's edge is the edge of a rock, a hill, a bush, a tree. Or sometimes, with a stretch of ground or water or sky, the image just fades out at the margin. Either way, unlike most pictures, these vignettes lack a window frame. The picture is just an extract. The scene continues off-picture. Not so the vignette. In the vignette, the scene does not lead off-picture. You notice how, in Bewick, things like trees and houses are never half-cutoff by the edge of the image, to suggest that the world goes on. Things exist whole and entire within it". Tom Lubbock The Independent 15th December 2006 (HERE). Below, one of Bewick's Vignettes, apparently of Bewick himself, as a thirsty traveler drinking from his hat, drawn and engraved by Bewick (1797) from HERE. One of the remarkable features of these Vignettes is how small they are - in 1971 the Black Cat Press published a limited edition miniature book containing fifteen vignettes printed from original Bewick blocks on Japanese paper. The book was bound in red Moroccan leather and measured just 66mm x 54mm.